Nola is two years old today!
" Sir Sebastian " .... Ready for game day!! Coffee time.. nap time.. Luci girl is always ready! Dee and Angel.. Chill'in ! Thank you Rhonda! Sir Sebastian .. Loving his blanket! Sebastian in his sweaters Momma Mara made... Love those eyes ! "Guess who cheering for the Saints"... Sebastian! "Alfie and his pal Buddy"... The neighborhood bird watching team... Thanks Ashley! "Sir Sebastian".. Loving life with his new mom Dawn.. "Look at all my new toys!" Happy 4th of July 2016 From Uncle Sam.. Aka Adam Prince Charming..
Adam Prince Charming .. Visiting his favorite pet store..
Hi Mrs. Linda! I am sorry so much time has passed since I have last updated you on Amadeus! Amadeus is doing great! We had a little bit of a stressful move into the new house (completely my fault) but all has settled down and he is LOVING the new space to roam. I am so lucky to have found you and gotten my sweet boy! He is my snuggle buddy and my husband has fallen in love with him as well as my sister who is contemplating getting one once her and her fiancé are married and in a house! I have attached an updated picture. I am going to try and take some more as since I have taken this picture he has gotten a very distinct white line of peach fuzz around his nose that is adorable. I hope this message finds you and your family in good health and high spirits! Ginger and Lily .. Look out birds! "Look it Adam Prince Charming..charming the crowd on Memorial Day!" 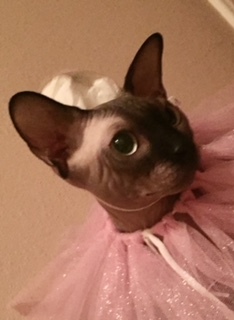 Adam Prince Charming ( father is LucidSphynx Adonis and mother is Pensacola Sphynx Shani). Helping mommy Cindy mail her package..